123 Astronaut is a raw-and-riffy guitar-based indie-rock power-trio based in Providence, RI. Jeff Robbins is probably best-known as the front person of Orbit, a group which released 3 albums on A&M Records, scored a Modern Rock top 10 song, and toured with Lollapalooza. 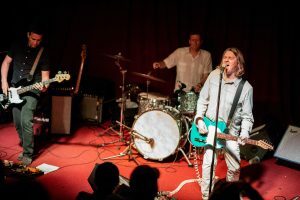 With Eric Hastings on drums and Keith John Benjamin on bass, the band’s energetic live performances have been earning them a reputation as one of the area’s best new bands.